Porcelain is a ceramic material made by heating refined materials, often including clay in the form of kaolinite, to high temperatures in a kiln at temperatures between 1,200 °C (2,192 °F) and 1,400 °C (2,552 °F). The toughness, strength, and translucence of porcelain arise mainly from the formation at these high temperatures of glass and the mineral mullite within the fired body. Porcelain was named after its resemblance to the white, shiny cowry, called in old Italian porcella (little pig), because the curved shape of its upper surface resembles the curve of a pig's back. Properties associated with porcelain include low permeability and elasticity; high strength, hardness, glassiness, durability, whiteness, translucence, resonance, brittleness; high resistance to chemical attack and thermal shock. For the purposes of trade, the Combined Nomenclature of the European Communities defines porcelain as being "completely vitrified, hard, impermeable (even before glazing), white or artificially coloured, translucent (except when of considerable thickness) and resonant." However, the term porcelain lacks a universally agreed definition and has "been applied in a very unsystematic fashion to substances of diverse kinds which have only certain surface-qualities in common" (Burton 1906). 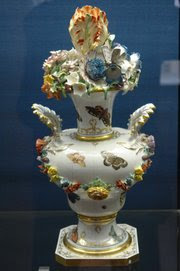 Porcelain is used to make table, kitchen, sanitary and decorative wares, objects of fine art and tiles. Its high resistance to the passage of electricity makes porcelain an excellent insulating material and it is widely used for high-voltage insulators. It is also used in dentistry to make false teeth, caps and crowns.